There are few places in Great Britain that can compare with the Peak District National Park. There are over 50 species of plants per square metre thriving in the Derbyshire Dales. The vast woodlands create a wonderful landscape, with clusters of native oak readily scattered creating a beautiful canopy for the habitats beneath. The area is rich in birds, amphibians, insects and other animals, in fact, the Peak District is one of the most important places in Europe for many species of birds. The area is increasingly facing many pressures from agriculture, where food production is taking precedence over conservation. 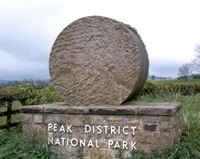 There are many organisations, like the Peak District National Park Authority, who are working continually to maintain and enhance the area's natural beauty. YOU the tourist can help maintain this cause by treating the countryside and it's wildlife with respect, and by ensuring that you leave everything as you found it.